I’ve groaned the same question at least three times a week over the past few months to friends, coworkers, trainers, and anyone else who would listen. I’d muscled through 92 workouts over the course of 90 days thanks to an intense dedication to my 2019 fitness resolution, and simply could not understand why my body felt—and looked—exactly the same as it did on January 1. My suspicions were confirmed when I took a mobility test with Under Armour, and the results I received after a series of one-legged squats, push-ups, and wall sits were…startling. Not only was I not getting stronger, but my body was a complete mess—I scored a 46.44 on the Fusionetics Movement Efficiency Test, which fell into the “poor” range. As someone who prides herself on working out every day, this felt like a pretty major blow. What the hell was going on with my muscles? My response was a resounding: “No.” Over the course of those 90 days, I had taken only a handful of days off, and made up for few mornings I slept through my alarm by doubling up on the weekend. I was overworking my body without giving it time to recover, and it was effecting my performance and ability to build muscle. I’ve read—and even written about—the importance of recovery many, many times in the past, but even in my extensive research I’d always figured that the whole point was to give your body a break to make sure you don’t get hurt. While that’s certainly part of it (and a lesson I ended up learning the hard way a few weeks ago), your muscles also need to recover in order to be able to get stronger. When we talk about “building strength,” we’re usually referring to daily workouts involving weights, HIIT-style movements, or something of the sort. And while doing 200 weighted squats and 400 crunches every day will probably help you along your fitness journey, you need to let your muscles recover in order to get all the way there. When you push through a workout, especially a strength-training one, you create tiny micro-tears in your muscles, and as they heal, they also rebuild and make you stronger. But if you’re not allowing them proper time to heal, you’re not giving them the chance to reach their full potential. While it may be tempting to push through the pain, it may be doing you more harm than good. “I get it: We’re all pressed for time and grapple with whether or to do five minutes of foam rolling or five minutes of squat jumps. Psychologically, people want to do the squat jumps, because they think they’re going to get more from that,” says McDonogh. In addition to all of this happening on a micro-level, the reality is that if you’re sore all the time you probably won’t be going as hard in your workouts. And ultimately, it’s not about how many days in a row you’re hitting the gym, but whether you’re doing the right work while you’re there. Taking a day off is only one part of a complete strength-training recovery series. Really, your “recovery” is what happens during every other time when you’re not working out. Everything from what you eat to how you sleep to how you treat yourself mentally in-between sessions affects how you perform in the gym, and it’s important to consider all of those factors when looking at how to get the most out of your sweat sesh. 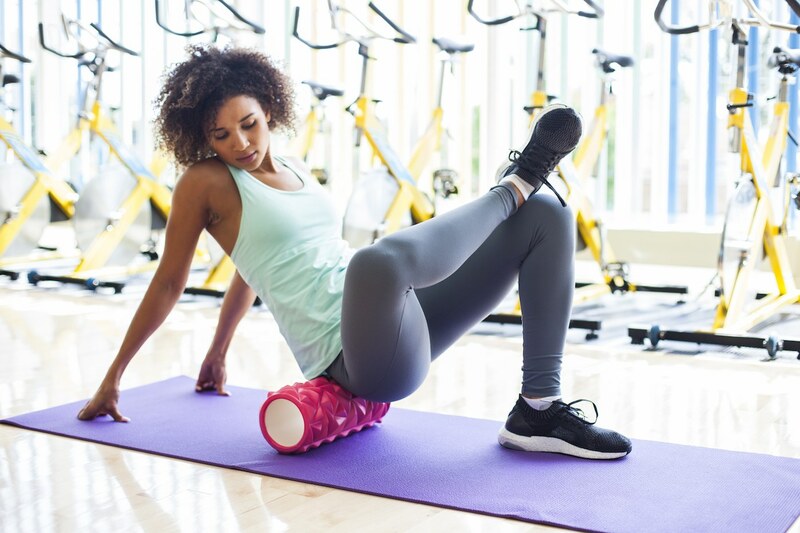 Then, of course, there’s foam rolling, which McDonogh cites as a point of priority in any fitness regimen—no matter how much you hate doing it (#itme). “When your muscles are tight, it’s like having a knot in your shoe lace, and foam rolling kind of releases that knot or releases that tension in your muscle,” he explains. “When we keep layering tension, upon tension,upon tension, muscles get tighter and tighter and shorter and shorter, and then you become sore for longer, which means you’re not recovering as well.” As we now know, poor recovery equates to poor results. “It’s a daily thing… it’s like taking your vitamins. You may not notice a difference right now, but doing it on a consistent basis, the body is going to start to feel different,” says McDonogh. You’ll feel better in the moment, and will see real results over the course of 30 days. In addition to all of this, recovery can now also start while you workout—as long as you’ve got the right gear. Under Armour recently announced their new line of RUSH performance wear, which launches April 11 and is what the brand refers to as “the fabric version of an infrared sauna.” When you exercise, your body emits heat, and the UA RUSH fabric absorbs that heat, converts it into infrared energy, and re-emits it back into your body. “This recycled energy increases temporary localized circulation, promoting improved performance, energy and recovery,” the brand explains on their website. When you wear, it, they say, it also stimulates increased endurance and strength. “If you’re going to the gym five days a week, and you’re getting quality over quantity, there’s no way you shouldn’t be able to achieve the results you want,” says McDonogh. He suggests two HIIT-style workouts, two strength-training workouts, one steady-speed cardio workout, and—yes—a rest day. And if you need to do something seven days of the week as a means of stress relief, make sure two of them are low impact and low intensity—like walking or hiking. “When you finish an active recovery workout, you should actually feel better than you did when you started,” says McDonough, noting that you should never do two super-hard workouts back-to-back. I’ll admit: My own recovery routine could still use some work, but I’m working on it. Since my conversation with McDonough, I’ve gotten myself a foam roller (and actually started using it! ), and made it a point to intersperse my high intensity workouts with some lower impact ones. And while the effects have only been minimal—so far, at least—they have been noticeable. I held an entire plank series in my Pilates class yesterday for the first time ever. Progress is better than perfection. And right now, it feels better too. To up your own recovery game, these are the best foam rolling moves for every type of workout. And why you might want to consider CBD for soreness, too.